A quirk of nature has long baffled biologists: Why do animals push in directions that don’t point toward their goal, like the side-to-side sashaying of a running lizard or cockroach? An engineer building a robot would likely avoid these movements because they seem wasteful. So why do animals behave this way? A multi-institutional research team, led by Johns Hopkins engineers, says it has solved this puzzle. In an article published in the Nov. 4-8 online edition of Proceedings of the National Academy of Sciences (PNAS), the team reported that these extra forces are not wasteful after all: they allow animals to increase both stability and maneuverability, a feat that is often described as impossible in engineering textbooks. 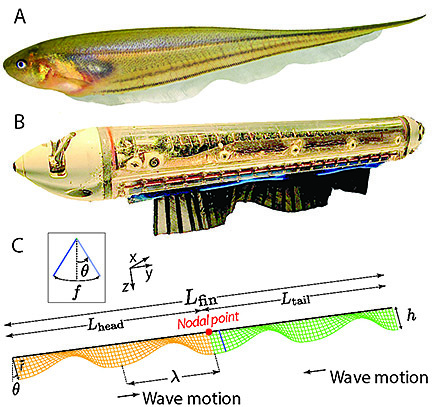 This illustration depicts a glass knifefish (A) and the robotic fish (B) used in the research concerning a mystery in the way animals move. The solution to the animal movement mystery surfaced when the scientists used slow-motion video to study the fin movements of the tiny glass knifefish. These fish, each about three inches long, prefer to hide in tubes and other shelters, a behavior that helps them avoid being eaten by predators in the Amazon basin, the natural habitat of these shy fish. In a lab, the team filmed the fish at 100 frames per second to study how they used their fins to hover in these tubes, even when there was a steady flow of water in the fish tank. The research team developed a mathematical model that suggested that this odd arrangement enables the animal to improve both stability and maneuverability. The team then tested the accuracy of their model on a robot that mimicked the fish’s fin movements. This biomimetic robot was developed in the lab of Malcolm MacIver, an associate professor of mechanical and biomedical engineering at Northwestern University and a co-author of the PNAS paper. Other co-authors on the paper were Izaak D. Neveln and James B. Snyder, both Northwestern doctoral students in the Neuroscience and Robotics Laboratory supervised by MacIver; Eatai Roth, a former Johns Hopkins doctoral student now at the University of Washington; and Terence Mitchell; a former Johns Hopkins postdoctoral fellow now at the Campbell University School of Osteopathic Medicine. This research was supported by National Science Foundation grants 0543985, 0845749 and 0941674, and by Office of Naval Research grant N000140910531. Pictures and video available; contact Phil Sneiderman.